South Coast Plaza bistro specializes in authentic Italian fare and thin-crust pizzas. 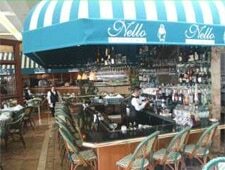 : A sister restaurant to Antonello Ristorante and Quattro Café, Nello Cucina sits on the first floor of South Coast Plaza's home store wing off Bear Street. Guests can dine either inside the cozy bistro festooned with dark woods and light accents or in the mall's courtyard under a trestle filled with faux vegetation. Chef Pino Domicolo brings his authentic Italian fare to the menu, and is big on using the brick-fired oven to lend smoky flavors to thin-crust pizzas. Italian classics prevail, like the caprese salad, minestrone soup, veal lasagna, linguine and clams, and spaghetti carbonara. Quite a few Mediterranean bites, like tabbouleh, labni and skewers, are also scattered throughout the menu. Seasonally inspired dishes may be enjoyed as well. Additionally, a happy hour menu is offered from 3 p.m.-6 p.m. on weekdays.